Saag paneer is one of the first Indian dishes with which I felt comfortable enough to order in an Indian restaurant and be fairly confident of what it was I would be receiving. Smooth, creamy spinach with cubes of cheese that tasted like a cross between mozzarella and ricotta cheese (although at the time I was not even familiar with ricotta - I would have said cottage cheese, but with a drier consistency). We always went there for dinner, so I had not yet had the opportunity to sample a range of dishes, so once I found a dish I liked, it became the dish I always ordered. It was not a bad choice. Equally tasty with either basmati rice or naan, it was healthy, filling, and so creamy smooth that it slid down my throat in the most luxurious way. Now that I am comfortable making chapatis, I decided it was time to tackle paneer. I have seen recipes for making your own, and I have seen it made on every Indian cooking show, but I thought maybe I should buy it already made the first time I am going to use it, so I have some idea of how it is supposed to behave. I found a package on my last trip down to Devon Avenue. It looked like a cross between cream cheese and tofu, but it was much more sturdy and, easy to manage. I ran into some confusion when I was looking for a recipe for saag paneer. I could not find anything in any of the Indian cookbooks on my shelf. I finally found a recipe for paalak paneer in The Everything Indian Cookbook that called for spinach and paneer, so I decided to try that. I thought maybe the difference in the names was a regional thing. 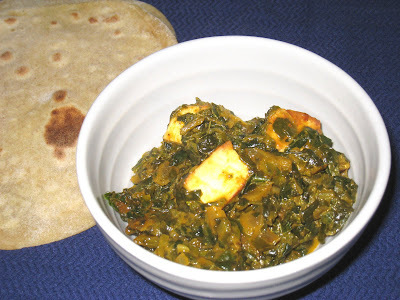 After rooting around online, I have learned that the difference between saag paneer and paalak paneer seems to either lie within the consistency of the dish, or what kind of greens are being used. I am only guessing here, and basing this on bits I found here and there online, but as far as I can tell saag is a dish made of spinach or other greens, while paalak means a dish made of spinach only, so if you made mustard greens and paneer you would call it saag paneer, not paalak paneer. On the other hand, I have also read that paalak paneer has a thinner consistency than saag paneer and that is the difference between the two dishes. If there is anyone out there who can help clarify this for me, I would be most grateful. So I decided to use the recipe for paalak paneer in the Everything Indian Cookbook by Monica Bhide. I cubed and fried the paneer according to the instructions (although I used only enough oil to coat the bottom of my cast iron skillet). The rest of the recipe was straightforward enough that in a short time I was looking at that beautiful bowl of deliciousness you see up at the top of this post. It was delicious with homemade chapatis, but it would be equally good with rice. The only thing I will do differently the next time I make it is that I will not remove the seeds from the serrano peppers. There was no heat at all. They did add to the flavor, but it could have used some of the heat. It was one of those situations where I knew better, but followed the directions in the recipe anyway. I will leave the seeds the next time I make this, which will be soon. In a medium-sized pan, heat the oil on medium. Add the onion and fry, stirring continuously until the onions are a golden brown in color, about 5 minutes. Add the ginger-garlic paste and saute for 1 minute. Add the tomato puree and cook for 2 minutes. Quickly add the green chlies, turmeric, garam masala, cumin, corinader, cayenne and salt; saute for 30 seconds. Add the paneer to the spinach mixture; saute, uncovered, for 5 minutes. Garnish with the heavy cream and serve hot. * In a deep skillet heat enough oil to cover the bottom over medium heat. Fry the paneer, a few pieces at a time, until golden brown on all sides. Remove and place on a paper towel to absorb excess oil.